I am proud to announce that my book, Assassinations, Threats, and the American Presidency: From Andrew Jackson to Barack Obama, is now available in paperback as of March 1, 2017. You can purchase my book through Amazon, Barnes & Noble, Books-A-Million, and my publisher Rowman & Littlefield. Throughout American history, Presidents and Presidential candidates have faced countless assassination threats and attempts on their lives. These threats have extended not only to sitting Presidents and candidates but also to Presidents-elect and former Presidents. 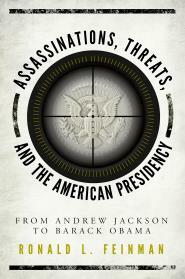 Assassinations, Threats, and the American Presidency: From Andrew Jackson to Barack Obama walks through Presidential history, looking at the countless assassination threats and attempts that have occurred throughout history. I discuss the Presidencies of sixteen Presidents, as well as three important candidates and five living Presidents today, and how they were directly threatened with assassination, ranging from the first known threat to Andrew Jackson in 1833, to threats to Barack Obama in late 2014. All nineteen of these Presidents and candidates were threatened with assassination—six being killed, three wounded, and ten unhurt. Additionally, I reveal information about some failed attempts, which, had they been successful, could have resulted in fifteen different men who would have become President of the United States. Which ones would have been able to fill the responsibilities? Which ones would have been disastrous in the Oval Office? Assassination attempts, both successful and failures have been part of our political culture for over 180 years, and the problem of Presidential security, safety and protection remains a serious problem today. With the President being faced with countless death threats, the Secret Service and FBI are forced to employ all kinds of technological methods to protect our Chief Executive and his family, as well as other top officials in the line of succession. I bring to light how these agencies have grown, both technologically and physically, to counter these attacks. I, also, shed light on how these threats to our Presidency have devastated, changed, and grown our United States into what it is today.